The advanced care planning button to open the conversation between customer-owner and provider. A Palliative Care Program, created in October 2015, formed partnerships with clinics and programs that supported the medical relief of pain and stress of a serious illness. As the program developed, it became apparent there was a need for communication tools to open the conversation between provider and customer-owner related to advanced directives. The tools needed to be culturally sensitive while also helping providers breech these difficult topics. The Your Care, Your Choices conversation guide did just that by using storytelling and culturally relevant imagery to explain the importance of advanced directives. In addition to the conversation guide, brochures, digital lobby displays, a website, and other communication tools were used to get the word out about this important topic. These tools were adapted to communicate to customer-owners of any age, as it was determined that everyone should have an advanced care plan on file. Online learning modules were created for providers and care staff. These modules help teach the appropriate approach and conversation tools to remain culturally sensitive. A pilot testing of materials with customer-owners and various focus groups helped refine the message. Partnering with those customers who would be the ones completing the advanced care planning was a critical component of the project. The final product was released in the winter of 2017 and has already been requested internationally by both American Indian and Aboriginal health care organizations. Congratulations to the Advanced Care Planning team on their award and thank you to the customer-owners for their help in making a successful program. Don’t miss the second part of this article, discussing how relationships between organizations let to this success, coming to the fall edition of the ANN. 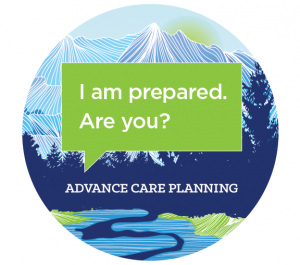 For more information on advanced care planning, talk with your primary care provider, or visit www.anthc.org/palliative-care.